lamp, a single bulb barely lights up the room at night time. So, when I heard that the Luke Roberts pendant was capable of 4000 lumens with its downlight and an additional 1400 upwards, I was keen to try it out. For comparison, a single Philips bulb achieves around 800 lumens, so this is 5 times as bright just for the downwards facing LEDs. First of all, I should address the price, this costs €699 which is about £610, and for me, that is a huge amount to spend on a lamp. So, this isn’t exactly a cost-effective buy, but it isn’t awful either. The RRP of a Philips Hue E27 bulb is £50 and you, in theory, would need at least 5 of them to achieve close to the brightness of this plus the cost of the fittings. Most people won’t use that many E27 bulbs in one room so the colour GU10 will set you back £50 each too, and in theory, this would require around ten bulbs to achieve the same. These are not like for like products, but the shock of the initial price isn’t as bad as it seem. Also, you can easily buy a designer lamp from places like John Lewis which cost more than this without any bulbs. then this will probably work for you. 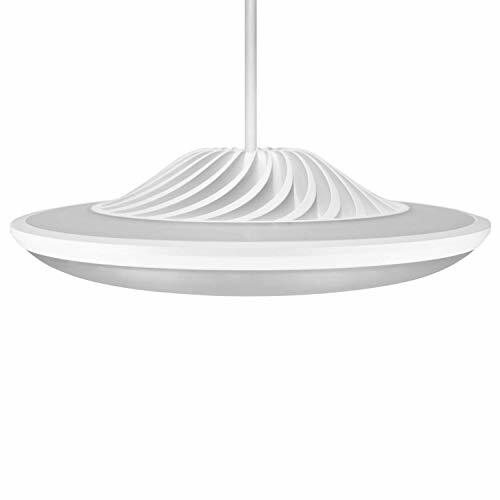 Its design is largely dictated by its functionality, with the lamp having a similar appearance to a UFO. It circular design has the down-facing LEDs section bulging out and with the large LED array clearly visible. The top of the lamp then has another smaller array of LEDs circling an attractive spiral design that leads up to the wiring. It certainly not ugly, and if you like a minimalist modern look this will probably be quite an attractive lamp for you. The fixing bracket itself is very large as there is an LED converter built into it, so you wire your electrical wiring up to one side then the lamp up to the other. The bracket has three hooks with two being used for wrapping the cable around to adjust the height then the middle one to dangle the lamp down centrally. You will need to make sure it using the middle piece or the plastic cover is impossible to fit (as I found out). Overall, the hardest part was fitting the plastic cover over the bracket. the directional LED settings within the app. This is where the fun begins, this lamp is designed entirely different than anything on the market I am aware of. There are upwards firing coloured LEDs and downwards facing White/Yellow LEDs. downlight completely, firing the light upwards. right you can hit a button to alter the brightness or rotate the LEDs. it on all day like this. Luke Roberts is working with 3rd party systems to integrate their lamp, and the Bluetooth standard does mean other things can communicate with it, but with the lack of Z-Wave or Zigbee means this is limited. At the moment Homey, Guh.IO and openHAB are the only systems that can work with this. Homey is an excellent option for a Z-wave home controller due to the range of standards they support, but as far as I am aware their market share is tiny compared to the likes of Samsung Smart Things. There is not even IFTTT support so you can’t make your own integration with other systems easily, even if it did, it would still require the Bluetooth connection with your phone. It looks like openHAB could facilitate cross-platform control but it looks far more advanced than IFTTT and from what I can tell requires you to roll your own controller with either with Windows/Linux or the best option would be the RPi3. Assuming you could then get openHAB to work with Luke Roberts, I would expect the RPi3 would need to be within range of the lamp for Bluetooth to work. The one saving grace as a smart home device is that you can enable this to work with Alexa so you will not be totally reliant on on using the app to control the lighting. solution if you only have one light source in your room. while maintaining the ability to control the scenes. factor in its performance compared to other smart bulbs. rather than other systems actively trying to integrate with them. then this is worth considering. A well made innovative smart lamp with fantastic light output. Poor cross-platform compatibility will make it a hard sell for home automation enthusiasts. For those wanting a smart statement lamp then this is great.